When running a Recover Drive it is usually best to select and search the entire Hard Disk (If your hard disk contained 3 separate partitions, e.g. Drives E:, F:, G:, and your formatted only your G: drive, then it would be best to select and search the G: drive only). In the example shown in the screen shot below an external 75GB USB hard drive containing photos has been accidentally formatted. The drive contained one partition only which was the size of the entire drive. Clicking on the drive letter in Windows Explorer shows that it no longer contains any files. Select Hard Disk by clicking it with your mouse (as shown in the screen shot), then press Next. 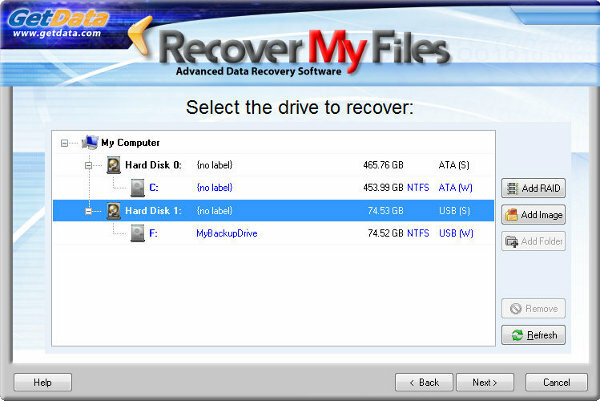 During an automatic drive recovery, certain pre-selected file types are used to assist in locating the missing Filesystem (i.e. your file and folder structure). Recover My Files searches for these file types by locating the file header and footer and then uses the information found to help pinpoint the missing Filesystem. Files found by their header and footer are called Lost Files. 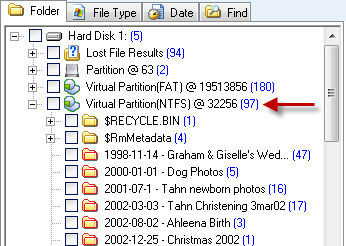 This option allows the user to manually select the file types to assist in locating the missing Filesystem. It is suggested that you only use this option to change the pre-selected file types if you do not have any of the pre-selected file types on the problem disk. For example, if the problem drive had only HTML files on it, it would be necessary to select the HTML file type. In most cases the common pre-selected file types will be adequate and additional file type selections will NOT be required to locate the entire file and folder structure containing all files. You may consider adding it to the list if you have a specific file type that is essential to recover. The benefit of adding a file types is that in addition to helping locate the file system, you are simultaneously searching for the Lost File type by looking for its header, structure and footer. 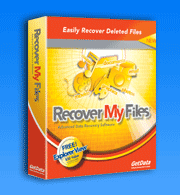 If the file system has been destroyed and cannot be recovered, you may still find the important file as a Lost File. However, be aware that adding file types will slow down the search. We suggest that you do not select more than 10 file types at any time. Phase 1 of the search attempts to locate and rebuild then entire lost partitions (drive letters). Whilst the search is in progress, expand the recovered partition (using the '+') to determine if your missing files have been located. If they partition was found and you can click on your missing files and preview their content, STOP the search and save your files. Once the partition recovery phase is complete, Phase 2, a search for Filesystem records will automatically commence. This is a sequential search of the drive for Lost Files, which help locate the missing Filesystem records. On the main program screen, near the progress bar, you will see a field called Filesystem Records. Each Filesystem Record is a file that has been found with its full file name and folder location. or, if time is not a concern to you, let the search run to the end. Expand the search results (using the '+') to determine if your missing files have been located. In a Recover Drive search, the "Folder" tab of the search results screen is usually the best place to look for your files. click on a file to show the file properties (area 5b) and the file preview (area 5c). If you are happy with the search results and can preview your missing files, you need to purchase a product activation key in order to save the files to another drive. Use the Buy Online button in the program, or visit www.recovermyfiles.com and follow the purchase links. Learn more about the types of license, Standard, Professional or Data Recovery technician here. All this, brought back from the DEAD, by your software.